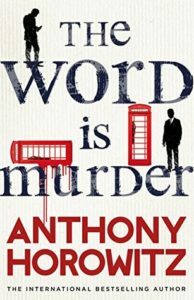 The Word is Murder by Anthony Horowitz blurs the line between reality and fiction as a murder mystery plot is depicted in an unusual narrative style. It begins in third person narration, with Diana Cowper entering Cornwallis and Sons’ funeral parlour to arrange her own funeral, only to be murdered that same day. Did she already know she was going to die, or is it merely a coincidence? Being an older lady with a famous actor for a son, at first glance she doesn’t appear to have any enemies that would wish her harm, and nothing was taken from the house to indicate a burglary or to indicate that her son’s fame was a motivational factor. The novel then takes a step back into first person perspective, introducing us to novelist and main character, Anthony, and detective Hawthorne. There is a clash between reality and fiction as Hawthorne protests that Anthony is including too many false details about the case, wanting the book to be factual and dismissing the added authorial details which help to set the mood. There are many such instances throughout the book, with it being unusual for the novelist to take such an active role and speak directly about the methods of writing. That said, the murder plot does not lose precedence, with suspense being created steadily and a multitude of locations being visited by the duo. Even though Hawthorne has been dismissed from the force, his manner has a way of making people talk to him, as he knows just the right time to apply pressure to the suspects. We also get a decent overview of each character’s history, as the plot takes us back into Diana’s past and her guilt at being a hit and run driver. Has the past really come back to haunt her all these years later? 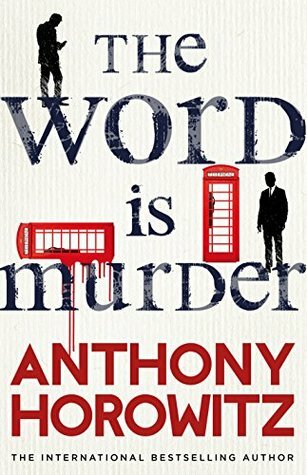 With the murder mystery plot escalating as the book went on, it was interesting to see where the different avenues of the investigation would lead Anthony and Hawthorne, especially as Hawthorne keeps everything close to his chest and is reluctant to share any leads before he has to. This is much to Anthony’s frustration, as in order to tell an effective story he needs all the facts and to know exactly how Hawthorne thinks. As such, we see Anthony develop his own leads and pursue his own suspicions, leading us into the world of acting and artifice as he considers the role of Diana’s son Damien. It felt strange having the author as the protagonist, especially as we are often given little asides about his previous work and witness meetings between him and his agent. This gave the book a sense of realism, but the entire way through I was questioning it, thinking that this cannot possibly have happened in real life. It created an additional layer of distance that we don’t usually have with a first person narrator, and I found it hard to take his words at face value. I found it just as hard to appreciate Hawthorne as a character, as his very nature is enigmatic and we learn very little about him as the plot progresses. All we see is his determined way of getting suspects to reveal all, with a grumpy demeanour that often sees him snap at Anthony unnecessarily. He works alone, letting Anthony come along purely because he wants this story told, yet he never seems egocentric. It’s almost a mystery as to why he’s so keen for there to be a book at all, and I was both intrigued and indifferent to him as a character. Despite this, on the whole I was impressed with the narrative style and what the book was trying to achieve. The murder mystery keeps you engaged and I wanted to find out what had happened and if Diana really did know she was going to die that day. The banter between Hawthorne and Anthony helps to keep things light and adds in some much needed humour, especially as events become more sinister and dangerous for all involved. I am still unsure how I feel about having the author as protagonist, and don’t believe that I would be interested in pursuing this further if a series were to emerge. However, as a one off this novel is worth a read. Different to any other Anthony Horowitz book I’ve read, this book blurs the lines between reality and fiction by making the author become the protagonist and interact directly with the other characters. Whilst the murder mystery continues to be engaging throughout, I had my doubts about the main characters and am not sure that I fully connected with the way the story was being told. Nevertheless, Horowitz is a supreme storyteller and I always look forward to reading his new material.